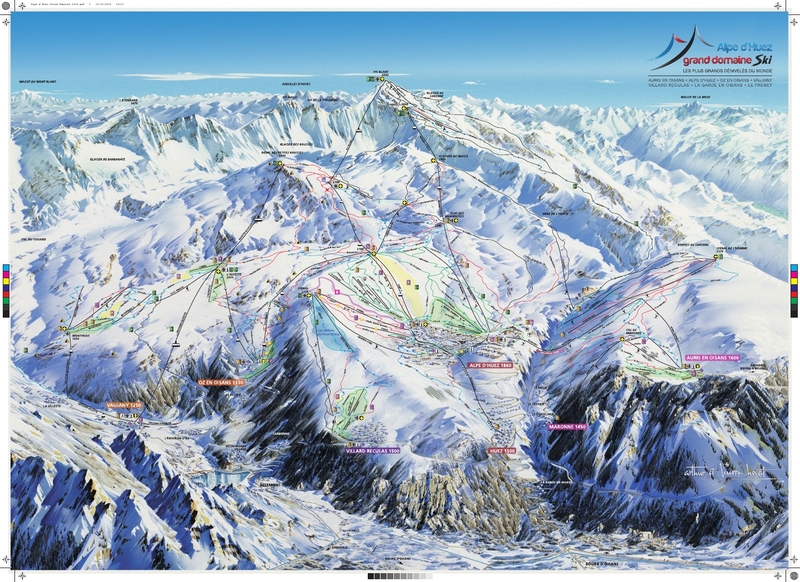 Alpe D'Huez is one of the highest mountain European resorts and the largest in France. It’s the ski station of the first international category. It is also one of the 20 resorts in the world where lifts serve a vertical drop of over 2000 meters. For beginners, there is a huge ski area right next to the resort. With the weather at the resort also everything is in order - because of the unique position on the upper plateau, oriented to the south, the sun in the Alpe D'Huez shines 300 days a year, without sitting down until five in the evening even in winter. That’s why the resort received the second name - l'Ile du Soleil ("Island of the Sun"). And from the surrounding slopes of the mountain peaks in good weather, you can look around a quarter (!) of the entire southern part of France, from the Italian border to almost the Central Massif. Alps D'Huez has located 60 km from Grenoble, on a high (1860 m) plateau of a huge massif of Grand- Rus, south of Mount Peak Blanc (Pic Blanc, 3330 m). It is one of the oldest (opened in 1936) and universal resort regions of France, known both as a beautiful winter resort with a large number of diverse trails, and as a summer recreation centre with clean air and characteristic natural and climatic conditions. The time of transfer to the resort from these airports and train stations is approximate because the transfer time could be impacted by traffic conditions and current weather also. Here, in the Alps2Alps, we provide maximum profitable and beneficial rates for transfer services at any time. Even if you go to a chosen alpine ski resort in the highest season, we still guarantee the lowest prices for all our services. Our company never overstates prices for the customers, opposite we consider as many factors as possible to lower our standard rates, whenever it could be done. We always recommend booking services in advance in order to get access to best discounts. Alps2Alps always offers significant discounts for transfers in off-peak and mid-week days. What is why notice that, if you are looking for the best deals, travelling outside of the peak season or in the middle of the week leads to the greatest savings (up to 60% in total). Your quote will also depend on the availability of the car, the transfer schedule, the use of the vehicle and other costs, such as road tolls and parking fees at the airport. If you have any specific requirements, please contact us to discuss your needs. Alpe D'Huez is one of the most famous winter centres of the country and one of the few world resorts with a height difference of more than 2000 meters (from 3323 meters at the top of Lac Blanc to 1100 meters in L'Anversen-d'Oz). At the same time, the resort's conditions, famous for the most complicated "black" descents, make it possible to clearly separate the complex slopes from the simpler ones and offer excellent conditions for experienced skiers, as well as for youth or families with children. Alpe D’Huez provide a lot of opportunities for family recreation. There are 3 ski schools, a nursery (for children from 6 months to 2 years), a Les Marmottes ski school (2 to 4 years) and a school (from 4 years), a municipal museum (Musee D'Huez et de l'Oisans), a grotto with ice sculptures (located at an altitude of 2700 meters at the lift to Pic Blanc), 2 swimming pools (indoor and outdoor), 2 cinemas, an Olympic open-air ice rink (runs from 10.00 to 23.00), snowmobile tracks and 50 km of plain ski trails, 30 km of hiking trails and many-many more opportunities for après-ski time. Choose Alps2Alps to start your holiday and be at the resort on time, drive in comfort and pay the most beneficial price for your transfer. It is always better to book a transfer to Alpe D’Huez as early as possible to get the best economy. Just call us or fill out the online request form. In Alps2Alps you are always welcome!